Strap into your seats; it’s another great Marc Platt script. Many writers can colour between the lines of Who’s sprawling canon with consummate skill. Platt extends the lines boldly and invents new elements as needed to tell a heck of a tale. In this case, he adds one more blot to the Doctor’s backstory, not quite as drastically as Big Finish’s Master (or Lungbarrow). The Rani, unlike the Master, takes full advantage of the Doctor’s past sins, using them against him in the present. MASTER: How does extracting this make humans more aggressive? RANI: Without that chemical, the brain cannot rest. MASTER: Ah, now I understand. You need it for your aliens on Miasimia Goria. I dropped in on your little domain before following you here. Chaos. Complete mayhem. What went wrong? RANI: Wrong? Who said anything went wrong? MASTER: Well, you rule there absolutely. I assume one of your little schemes didn’t turn out quite as you expected. At long last, it’s time for the Doctor to visit that unlucky, blighted world, Miasimia Goria. What happened there? What of its sleepless people? And what of the macabre experiments the Rani left behind? A few of her loyal retainers are still skulking in the ruins, along with a number of rebels who curse her name. But a new power has emerged from the chaos. If she ever escapes the prison where the Doctor’s sent her, she’ll have quite a job bringing that power to heel. The Doctor may have a thing or two to say about that. So does Mrs. Clarke. This is her first offworld outing, and it’s a trial by fire. She comes through with flying colours, despite some terrifying scrapes. She speaks truth to power, proves she can accept bizarre aliens as people, finds allies when the Doctor inevitably loses her, and falls afoul of one of his arch-nemeses so that he has to rescue her. Yep, she’s a typical classic Who companion. Most of the time, she “keeps calm and carries on,” but sometimes even she gets in over her head. A flustered Constance is oddly endearing: she doesn’t scream; she squeaks! I really like her. Nobody can ever replace Maggie Stables, but I am sure Colin’s happy to have another excellent sidekick. And yes, Siobhan Redmond and her sinister Irish lilt pulls off the cold yet charismatic Rani with aplomb. The Rani: Less worthy contenders would have festered and lost their wits. The Rani: But I am nothing if not patient. There’s a few minor characters and sideplots: prison personnel unsuccessfully trying to keep their star prisoner under control, and a few poor wretches trying to survive the post-apocalyptic purgatory of Miasimia Goria. They’re functional characters, but apart from the Rani’s prized experiment, they’re all overshadowed by the main players and central story. And while I found most of the story exciting, compelling, and action-packed, my attention wandered a little in parts of part 3 (which may be my failing rather than the script’s). Also, since the characters can’t spend all their time describing their surroundings, and audio dramas can’t carry too many voices at once without it getting confusing, the planet itself is more of a stage setting than a fully-realised world. There are some striking landmarks that do their best to counteract the limitations of the audio medium, but they remind me of the one or two dramatic elements of a stage backdrop used to evoke a larger context. For that reason (and for a quite moving moment near the end), I’d love to have seen Planet of the Rani on TV. Mind you, the kiddies would spend most of the second half hiding behind the sofa. There’s some creepy crawlies worthy of the wrath of Mary Whitehouse. Trivia note: Kahnu/Kanu means “Lord Krishna,” one of many avatars/incarnations of the usually benevolent Hindu god Vishnu. Who, as the Bhagavad Gita tells us, can also become Death, destroyer of worlds. Rajesh is yet another name for Krishna/Vishnu. Not sure about Chowdras and Degoor. I presume Pazmi is what we usually Anglicise as Padme. The trope of a child prodigy, abandoned by his parents and growing into a monster, is nothing new. However, the script James Joyce (who also had a big role in The Fifth Traveller) make him a surprisingly appealling character. When he finally comes out of his armour, it’s a moving moment. There’s hints of the Robot and Sarah Jane Smith in his infatuation with with Mrs. Clarke, but she’s dealt with eccentric prodigies and unruly youngsters back at Bletcheley, so she quickly figures out how to deal with him. Except when she’s locked inside a metal can. Yikes. If she could get through that without begging the Doctor to take her home, I expect she’ll be able to handle just about anything. 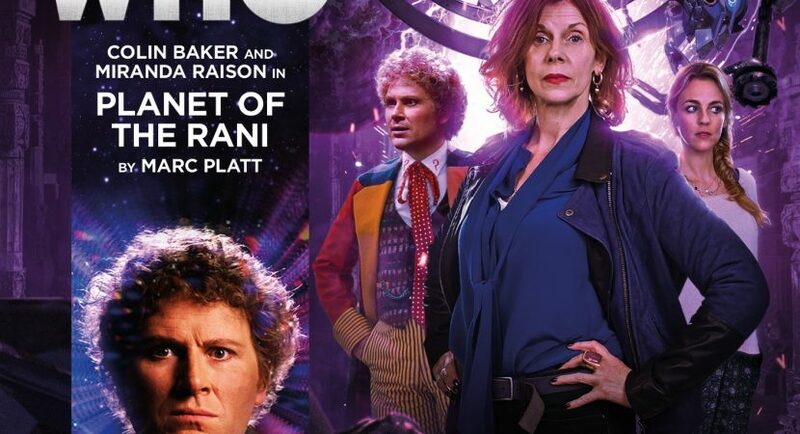 ETA: Once again, glancing at other people’s reviews after writing mine, I’m surprised at how many fans were disappointed that the Rani’s world turned out to be so bleak. What did they expect, after what the Master reported? Anyway, a planet whose name boils down to “Miasma Gore” sounds to me like a gruesome haemorrhaging disease.